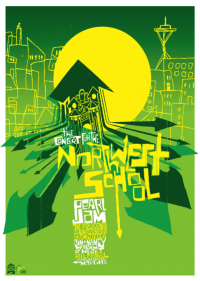 The first Pearl Jam's live performance of 2005 was Northwest School Benefit. It was started with Eddie playing solo "The Kids Are Alright". Then Boom Gaspar joined in. And when Eddie started "Porch" intro, all the band members went out, plugged in their instruments, and the show started to rock. It's was not a warm up song (there was no time to warm up) - true full-sized "Porch" with it's mind blowing jam! "Comatose" song debuted live at this show with very different early lyrics. This is an audience single-camera video of the main set, 2 songs from the encore are missing.